August 25, 2018 — Links International Journal of Socialist Renewal reposted from The Trouble — Democratic socialism is in the air. Since Bernie Sanders’s miraculous 2016 primary run – garnering 13.2 million votes and 23 state victories – the politics of democratic socialism has grown in popularity. I believe this popularity is based on its capacity to articulate clear and simple principles. As Alexandria Ocasio-Cortez (now famously) said on the Late Show with Stephen Colbert, “I believe that in a modern, moral, and wealthy society, no person in America should be too poor to live.” Who disagrees with that? It’s becoming clear that climate politics needs to catch up with these developments. Many have recognized the need to articulate a “Medicare-for-all”-like strategy on climate change, where people could see how solving climate change could deliver direct improvements to their lives. But, at a more basic level, what does a socialist politics of climate change look like? This is obviously a debate (and I won’t claim to have definitive answers), but the following essay is an attempt to lay out five basic principles of a socialist climate politics. A core theme across all five is that a socialist climate politics is dramatically different than the ‘third way’ technocratic policy approaches that have dominated climate politics over the last three decades. I should first say, however, that obviously 20th Century socialism leaves much to be desired for ecological politics (although many see positive developments in Cuba once they were delinked from the oil of the Soviet bloc). This movement must put both democracy and ecology at the center of a 21st Century democratic ecosocialism. #1 – Climate change is a class problem. This seems obvious enough. Rich people are responsible for causing climate change and the poorest bear the costs of droughts, rising seas, and floods. Yet, we are somewhat confused on this issue. The rallying cry of radical climate politics – “system change not climate change” – rightly blames the “system” of capitalism as the core cause of climate change. But how do systems change? While more liberal-minded “system change” theorists like Gar Alperovitz suggest we could incrementally move beyond capitalism via a “middle path of evolutionary reconstruction,” Marx and Engels are quite clear on how systems change: “The history of all hitherto existing society is the history of class struggles.” Too often the notion of “system change” doesn’t emphasize that we are fighting a class of people rather than a vague, impersonal “system.” Class struggle entails a politics that directly confronts the interests of the class in power – whether it be strikes, regulatory policies, or movements to expropriate property (just recently the idea of nationalizing the fossil fuel industryhas finally circulated into climate policy discussions). A class approach simplifies climate politics in way that makes our political tasks clearer. 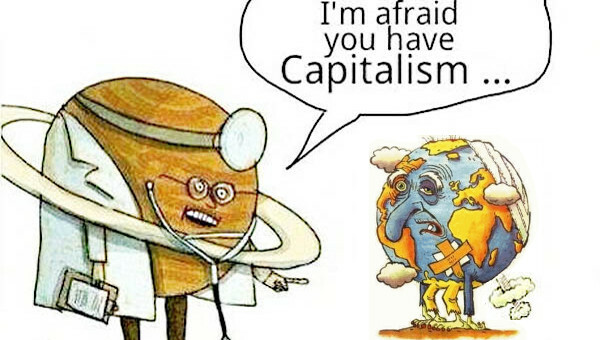 It is not “all of us” who are to blame (or, as the recent New York Times megastory, “Losing Earth” put it, “ourselves” or “human nature”), but rather the small minority of capitalists who control and profit from the production. If socialism could be summed up in one slogan it might be this: democratize production. Production could be geared not toward profit, but the social needs of human life – and a recognition of the ecological systems that make all human and nonhuman life possible in the first place. Yet, getting there will require a monumental struggle against those who currently control production for profit. How can we win this struggle? #2 – Climate solutions need to appeal to the material interests of the working class. History shows that overcoming entrenched power requires vast numbers of ordinary people: a massmovement where the state or other forces cannot ignore popular demands for structural change. So how can we mobilize the mass of people to the climate fight? We need to start by recognizing that the working class is the majority of the population. When I say “working class” I do not only mean white male coal miners or factory workers. At the broadest level, we could define the working class as those who must work to survive. As Sarah Jaffe and others have pointed out, the American working class of today is to a large extent female and disproportionately people of color. It includes not only industrial workers but nurses, teachers, warehouse workers, and retail workers. In the United States, there are more people that work at Arby’s than in coal mines. Kim Moody roughly estimates that after subtracting the 1% of capitalists who actually direct and control major corporations and various professional, managerial, and small business occupations, the working class constitutes 63% of the employed population. If you add all the millions who are currently “out” of the workforce due to disability, unemployment, and care responsibilities, it is closer to 75%. Moody’s first number overlaps with another jarring statistic: 63% of households could not afford a simple $500 emergencypayment for something like a ER visit or car breaking down. If climate politics wants to win, it must learn how to better speak to the interests of this 63%. In fact, it is impossible to imagine we are building a democratic movement without doing so. Why does this matter for climate politics? Because, for the most part, our entire political strategy on climate change as it exists now does not appeal to working class concerns. On the one hand, many climate policies are largely “technocratic” fixes that aim to tweak market incentives in ways opaque to working class sensibilities. Try explaining a “cap and trade” system to your average person (I have a hard enough time teaching this material). More problematically, one could argue climate policies often appear antagonistic to struggling workers. Taxes, fees, and “internalizing costs” are the language of the policies. If anyone in the climate debate appears to be advocating for working people it is the right who often claim climate policies will “cost” everyday people dearly. Take arch climate villain, Charles Koch, who framed his critique like this: “I’m very concerned because the poorest Americans use three times the energy as the percentage of their income as the average American does. This is going to disproportionately hurt the poor.” A reason for this is that many of the advocates of carbon taxes and fees are themselves middle to upper class professionals. It is this rather narrow slice of the population who have an oversized voice in climate debates (for example, the entire New York Times megastory on climate focuses on professional class men – scientists, politicians, and environmental non-profit ‘activists’). For this class, the “excesses” of modern consumption are seen as the problem – but the 63% struggling to make ends meet do not feel excessive. We will not win on a program of less, limits, and reductions. #4 – Don’t Tax Molecules, Tax the Rich…A lot! The local International Socialist Organization branch in my home city, Syracuse, recently made posters with this slogan: “Tax the Rich a Lot.” This sums up the socialist approach to fiscal policy quite nicely. While many climate policy wonks think we need to use the tax system to correct a “market failure” and internalize the costs of “externalities,” socialists believe we need to tax the rich to fund vital public services for the masses of people. A carbon tax is often framed as a measure applied on an entire economy – a working class commuter needs to ‘internalize’ the costs of emissions as much as a steel plant. It is a tax on a molecule (CO2), not specific people. A socialist approach needs to intensify the antagonisms – we need to tax them (the real polluters) to fund us (the working class). One example is Bernie Sanders’s policy of a tax on Wall Street speculation to fund free college for all. Similarly, the striking West Virginia teachers made a direct connectionbetween taxing the fossil fuel industry and funding better teacher salaries and benefits. Not only do most carbon tax policies fail to highlight these class dimensions – and thus it is not surprising when they fail, as a proposal did in liberal Washington – but they play into the right’s anti-tax populism by proposing policies that appear to tax “all of us.” Funding “us” also means socializing the revenue to build the massive public energy infrastructure needed to transition away from fossil fuels. Long term infrastructure is almost always funded by the public, not the private sector. Yet, proposals such as the Citizens Climate Lobby’s “fee and dividend” policy attempt instead to appeal to the right by advocating “revenue neutrality” (despite our need for a fuckton of revenue to solve the problem). The policy wrongly individualizes the returns through “dividend” checks to households. This might cynically address the “appeal to the working class” issue (who doesn’t like a check? ), but it will not provide the public resources needed to solve what is a very public crisis. Socialism is internationalist. Two slogans are at the core of socialist politics: “Workers of the world, unite!” and, from the socialist anthem The Internationalé: “The international ideal, Unites the human race!” These slogans understood workers had a shared global interest against a global capitalist class, but the idea of uniting the human race resonates differently today as humanity faces the prospect of “hothouse earth.”Although this ideal was distorted by the Stalinist maxim of “socialism in one country,” Marx and the socialist movement always imagined a global “revolution in humankind” (as Hal Draper described it). Similarly, we cannot solve climate change working remotely in our individual countries. Climate politics will require a kind of planetary solidarity across borders as workers, peasants, and indigenous peoples come together to see their shared interest in maintaining a livable planet. This planetary solidarity must understand global climate change is a criminal atrocity perpetrated by a small minority of capitalists mainly located in the Global North. This international solidarity movement must also reject the elitist top-down United Nations Conference of Parties (UNFCCC), where political and corporate leaders have failed for nearly three decades to forge the international solidarity required to address the crisis. The goal is to democratize control over providing for our basic needs. As Shawn Gude recently put it, “democratic socialism, at its core, is about deepening democracy where it exists and introducing democracy where it is absent.” Today much of what we need to survive is produced by firms, “private governments” only seeking profit. But, as explained above, democracy also means appealing to the needs of the vast majority of people who crave a decent, secure and comfortable life. Socialism would gear the entire economy toward “care,” and the needs of the many against the profits of a few. The struggle for decarbonization cannot be cast as purely technical or economistic “energy transition;” it must be about exerting popular control over life itself to veer us away from irreversible disaster.